“Kamakura, Home of the Samurai” consists of the mountain area characterized by defensive topography that exerted great influence on the samurai’s development of their government seat and important elements such as Shinto shrines and Buddhist temples that were built at the mountain foot and valley beds. The important elements are eleven Shinto shrines and Buddhist temples and ten archaeological sites of Buddhist temples, samurai residence, “kiridoshi” passes, and port. These date back to the Kamakura Period, a period of approximately 150 years from the end of the 12th century, when the samurai established the government in Kamakura, to the early 14th century. Because Kamakura received the patronage of the successive samurai governments after the Kamakura Shogunate as the birthplace of the samurai government, it maintains the original shape very well. The mountain area and the twenty-one important elements of “Kamakura, Home of the Samurai” also have been passed down to the present and remain in good condition. Also, at the compounds of Shinto shrines and Buddhist temples, the traditions of the samurai culture are maintained and religious activities and related events are performed still today. 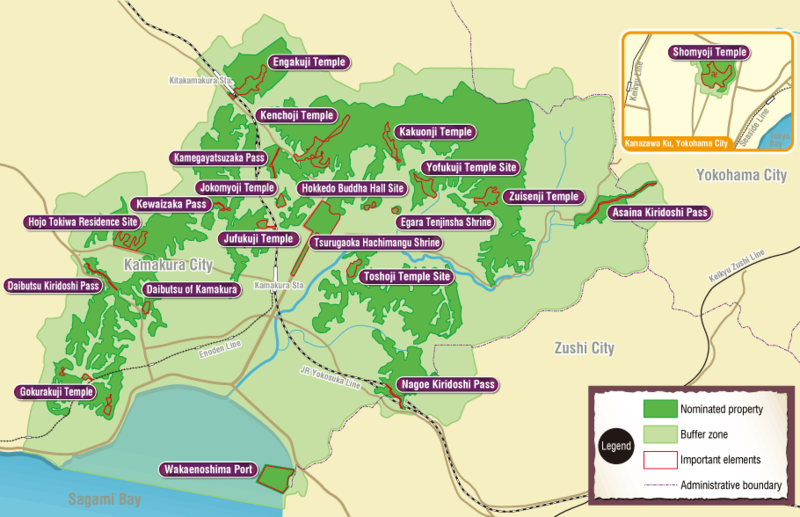 These properties such as mountain areas and port site etc, are divided in 10 parts, but the value of “Kamakura, Home of the Samurai” represents all of them as one whole. The most of the mountain area that constitutes “Kamakura, Home of the Samurai” is designated as a Special Preservation District of Historic Landscape under the Act on Special Measures Concerning the Preservation of Historic Landscape in Ancient Capitals (“Ancient Capitals Preservation Act”). This designation restricts alterations to the existing landforms etc. and conserves the original landforms dating from ancient times together with forests. Most of the Shinto shrines, Buddhist temples, and “kiridoshi” passes that are important elements of the property are designated and protected as Historic Sites under the Law for the Protection of Cultural Properties. In addition, many gardens, buildings, etc. that exist within each important element are also designated as Historic Sites, Places of Scenic Beauty, National Treasures, and Important Cultural Properties under the Law for the Protection of Cultural Properties. In 1964, a residential development plan was proposed for the mountain area (Oyatsu District) in the background of the Tsurugaoka Hachimangu Shrine, the central entity of Kamakura. In protest against this plan, local citizens, academic people, and Buddhist priests collected signatures from people who support the petition to stop the plan and conducted intensive fund-raising campaigns. After the concerted effort of the local community continued for approximately 1 year, their call for the preservation of historic landscape successfully resulted in the cancellation of the development plan; local people even purchased the ownership of the land with the money collected in fund-raising campaigns (the first national trust movement in the history of Japan). This movement eventually gave birth to the enactment of the Ancient Capitals Preservation Act in 1966. The enactment of this Ancient Capitals Preservation Act is a symbolic event showing that Kamakura is the birthplace of the preservation of ancient capitals in Japan and that “Kamakura, Home of the Samurai” has been preserved up to the present through the efforts and ownership of local people. Kamakura has a tradition of long-lasting efforts to protect historic heritage and natural environment. It is the responsibility of those who live in the contemporary age to ensure the conservation of these historic heritage and natural environment that have been handed down as the foundation of Japanese culture and to pass them on to future generations. The significance of the inscription on the World Heritage List is to ensure the transmission of “Kamakura, Home of the Samurai” to the future. The buffer zone is an area that is set out surrounding the World Heritage property area in order to conserve landscapes and settings. 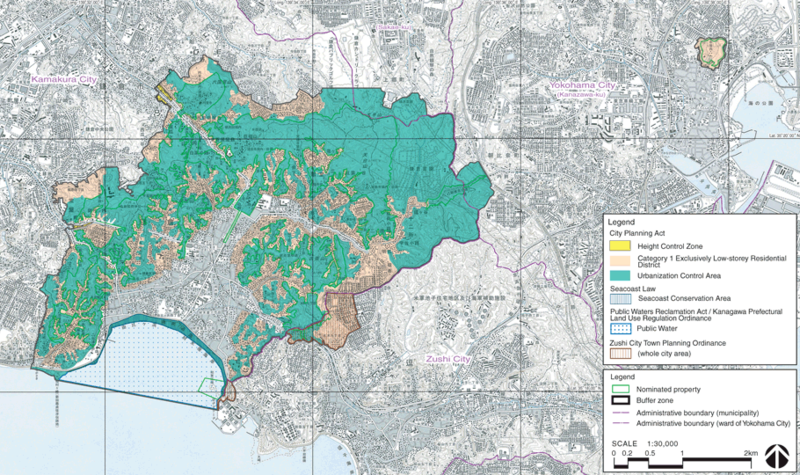 The buffer zone itself is not part of the area to be inscribed on the World Heritage List. However, it is required to put in place appropriate control measures based on laws and regulations that provide for building height limit etc., depending on the specific environment and conditions of the property. 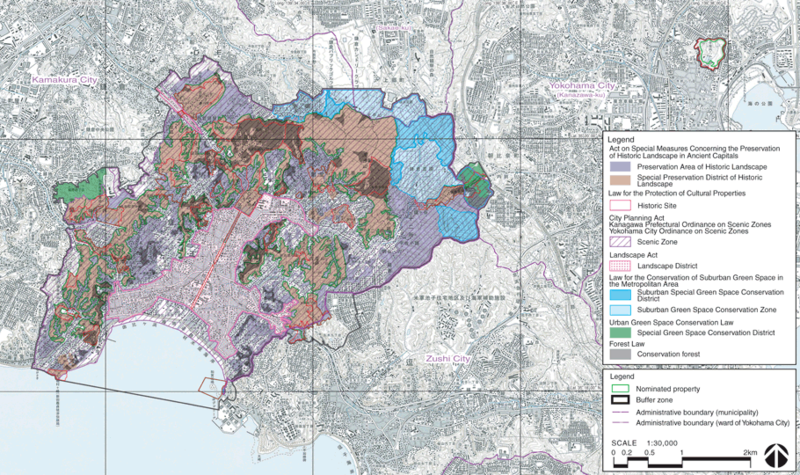 In Kamakura, to be specific, compliance with the existing control measures through the Scenic Zone based on the Scenic Zone Ordinance, the Landscape District based on the Landscape Act, etc. is considered to meet the requirements of the buffer zone for the World Heritage inscription. Extraction of soil and stones, etc. Posting or installation of outdoor advertisement signs, etc. Heap up of materials outside, etc. Height of buildings (15m), etc. Logging of tree stands, etc. Land reclamation from water etc.